The heatwave was well under way and I headed to London to meet up with Paul Mudge from The Beer And Pubs Forum for a saunter around a few pubs. I got into town an hour and a half before our meet up time of 12 noon, so I took a stroll across the Thames,heading toward Trafalgar Square. Spotting a sunbather down below. With an hour to kill I wandered around the National Gallery, I don’t mind a bit of art. Time to head to The Harp to meet up with Paul, I spotted him trying to get in through the open window just before opening time. I gave the Hophead a go, while Paul went with the Harveys. 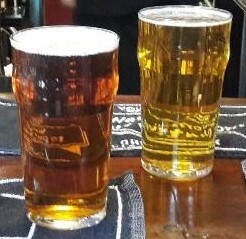 The Hophead was good, the slightly murky Harveys was changed without prompt for a fresh one by the barman. Before Paul thinks he’s going mad, I nipped back in here and took the last two photos after leaving him with the intention of a swift pint of Dark Star Six Hop which I spied earlier in the day, unfortunately for me it had by then morphed into Twickenham Redhead, so a consoled myself with a Weird Beard Mariana Trench before heading onward to Waterloo. There were five more pubs sandwiched between the last two photos and the preceding two, so more to follow soon. This is still one of the top London pubs, isn’t it ? When you say your Harveys was changed without prompt, do you mean the barman saw it was cloudy before you said anything ? It was Pauls pint and he hadn’t mentioned a problem with the beer, the barman who also happens to be the cellarman realised it was on its last legs and decided it wasn’t good enough.